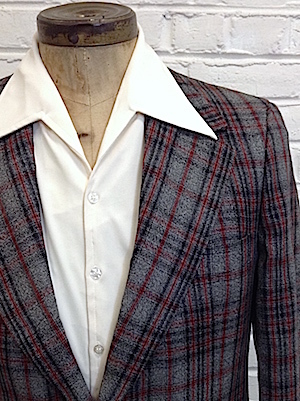 (41) Mens Vintage 70s Blazer! Funky Gray, Black & Red Plaid! 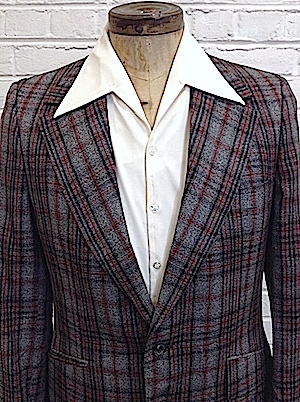 Home > Vintage Suits & Blazers > Suits / Blazers 1970's > (41) Mens Vintage 70s Blazer! Funky Gray, Black & Red Plaid! 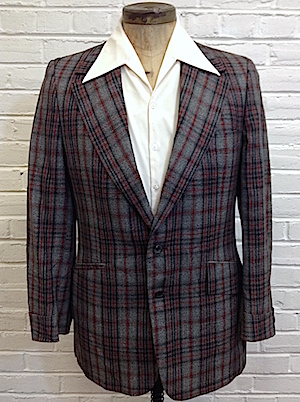 Mens vintage 1970s sport jacket! Get ready to disco dance in this amazing gray, black and dark red plaid blazer! Super wide 70s collar. Closes in the front with two marbled black and gray buttons with tone matching button on each cuff. One inner chest pocket with two lower flap closure pockets. Jacket has a dual back vent. 3/4 lined in a dark red acetate. Tagged Designed by Hamilton Park. No material tag but feels like polyester or a polyester blend. Condition: Very Good. The lower portion of the lining in the right sleeve is ripped. Not visible on the outer part of the jacket. Does not detract from the awesomeness of this blazer!